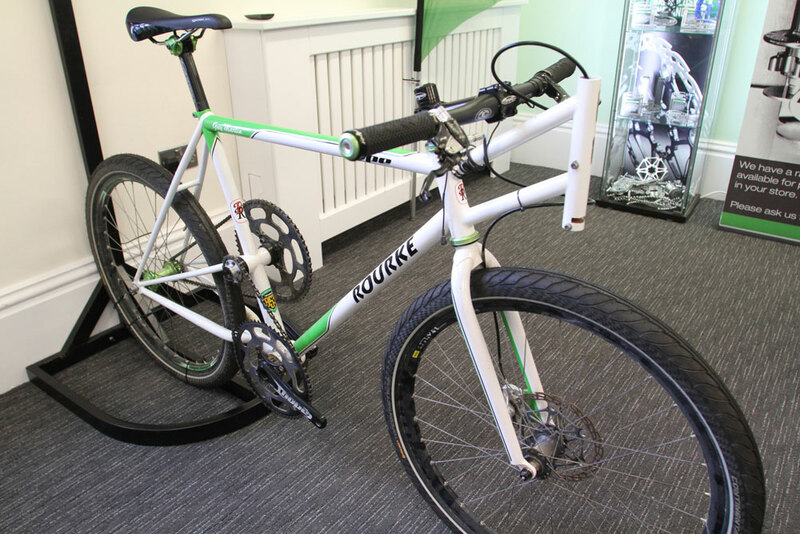 Darren from Silverfish wanted this bike more than anything in the world when he was a youngster, so he spent last year piecing together this concours-level retro bike. 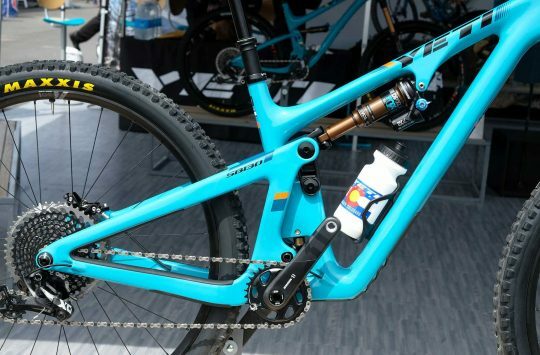 It features components from Bullseye, Grafton, Shimano, Ringlé Components, Answer, onZa and Manitou and more. Is this still the Ultimate? For some people, it is. Emerald. 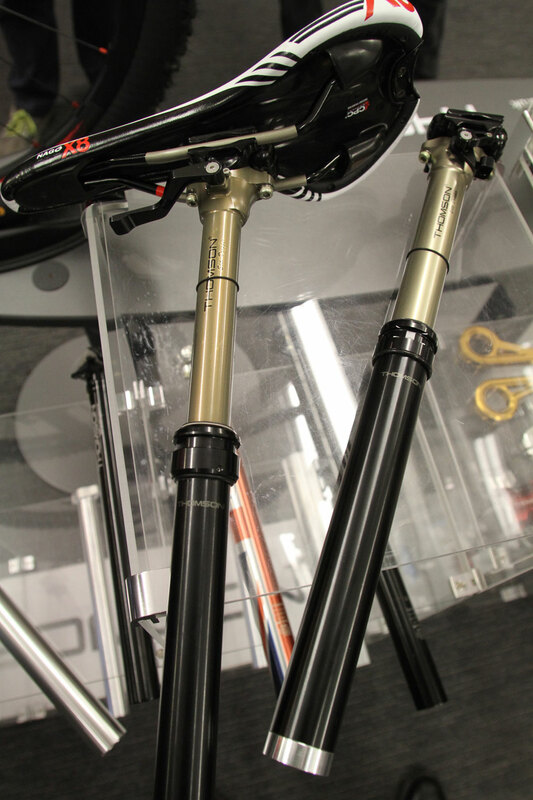 Watch for the Diamond enduro fork soon. Race Face goes bigger. The Race Face Canadians (from Canadia) showed off it’s new (800mm by) 35mm bar and stem. 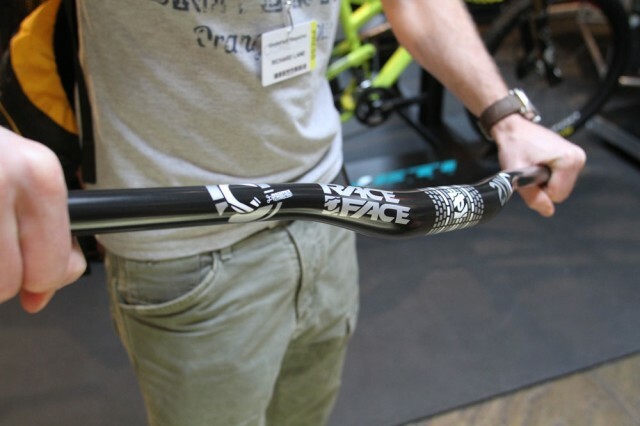 Launched a couple of years ago by Easton, it looked like the 35mm ‘standard’ might not gain any traction, but it seems that other companies are now getting on board – especially as it allows carbon bars to be made in wider widths without any loss of strength compared to the 31.8mm clamp size. 35mm in the middle. 800mm wide. 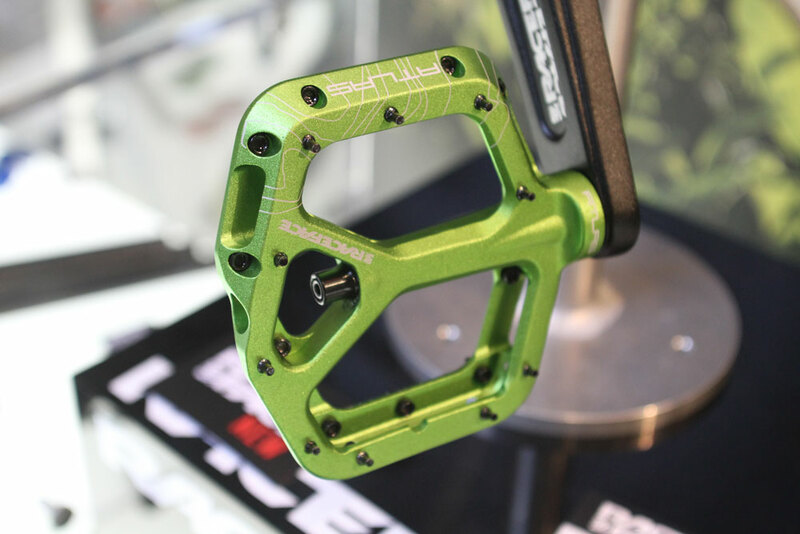 Race Face Atlas pedals are finally here. In many colours too! Meanwhile, over at Upgrade, it was showing off new forks from X-Fusion, a revamped Kinesis line – and some fresh colours on some of the bikes, like this CrossLight. 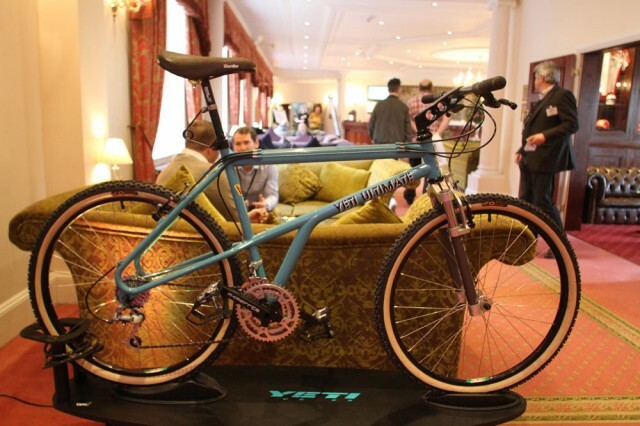 Funny how canti-braked crossers look a bit retro now. 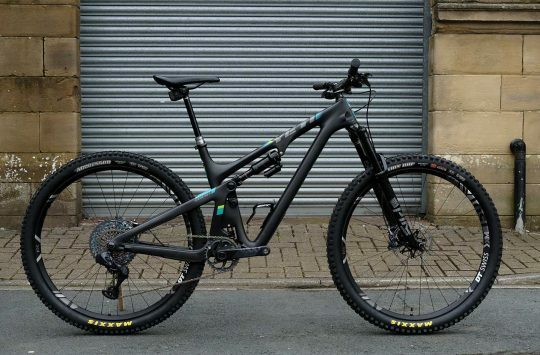 Chris (and Tim) from Mojo have had this bike built by Nicolai’s custom-build service to try out their take on Forward Geometry, 50″ wheelbase, head angles (63°…) and suspension. Virtually no bit of it is stock. We look forward to seeing this travelling at high speed. Thomson finally showed a near-production 27.2 post, with a Stealth-compatible post in the works and even a road post. Oh, and a titanium frame – but you’ve already heard about that, right? 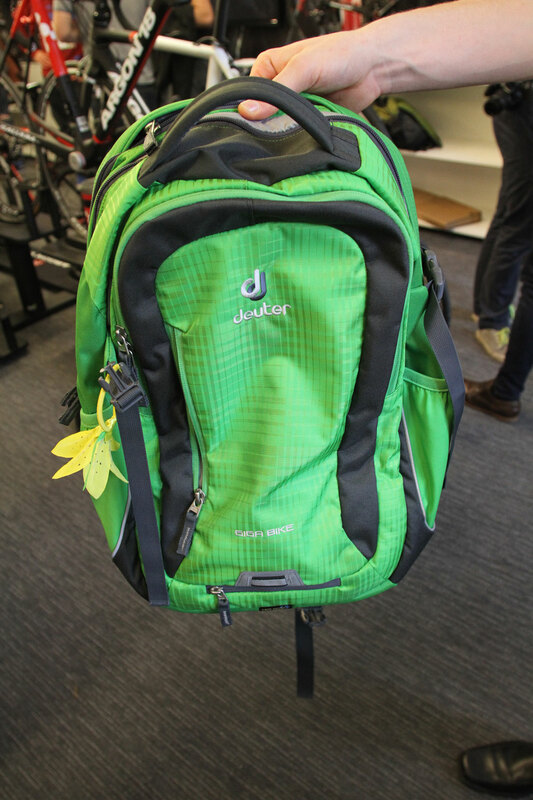 Deuter have a good range of bags in stock at i-ride. This is the commuter pack. We think the flower indicates something just for zee ladies. Hope has a good range of new stuff that we’ll cover in depth soon. 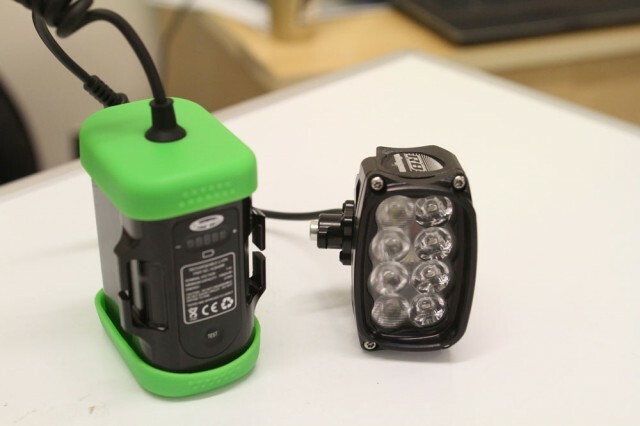 It is now making EVEN more stuff itself, with the battery packs on its Vision lights reverting to good old machined aluminium (with added rubber scuff guards for your frame). It also gains a power indicator LED. Oh, and is that the new R8 Subbuteo football stadium light? 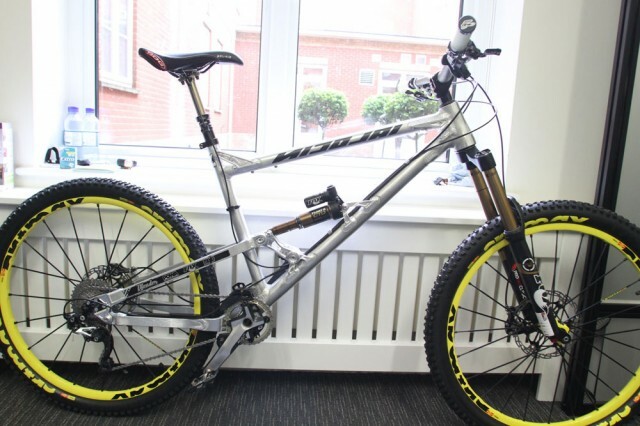 You might have seen a certain Guy Martin riding this behind a truck recently. And currently in development from Hope is this 42T inner sprocket for your 1×10 system. 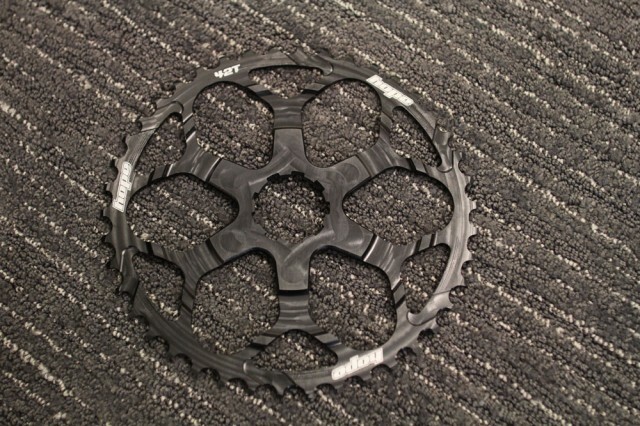 It features bracing ribs to keep the ring rigid against the cassette. 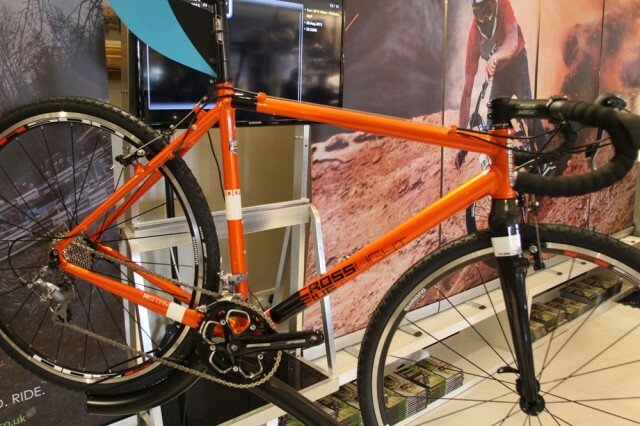 There’ll be Shimano and SRAM versions. 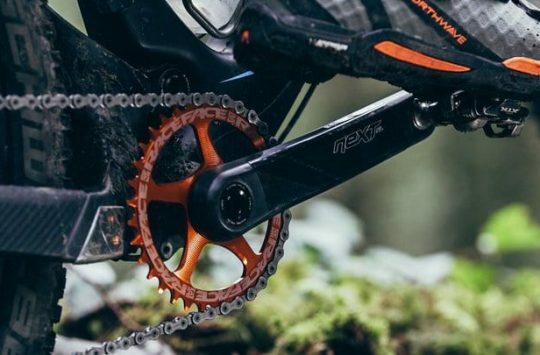 Remove a mid-range sprocket and add this out back for a mega gear spread on ten speed. Chipps’ favourite quirky product of the show was this minimalist single-sided road mudguard seen on the Ison booth. It fits under the QR skewer and really seems to stay in place for that bit of spray protection for your back. 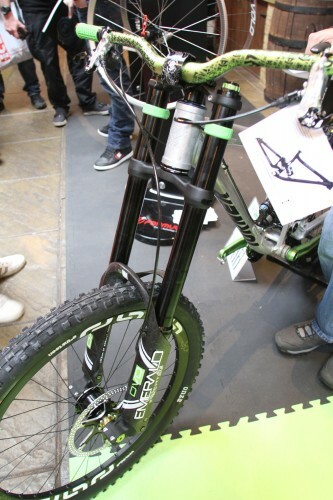 Reckon a version would work on a mountain bike? Single carbon pole and tiny ‘guard. 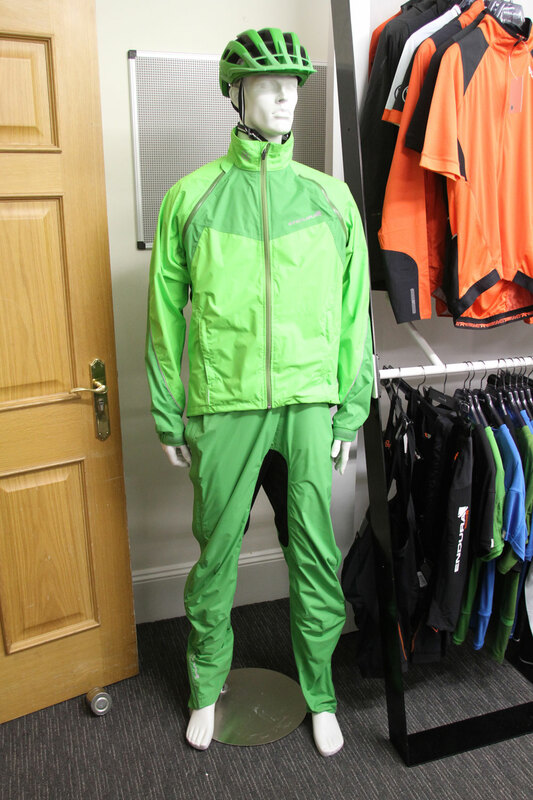 Endura has a ton of new stuff for all riders. We like this new Endura Humvee Convert jacket. It has zip-off sleeves and shoulders, leaving a mesh-backed gilet. It’ll be £84.99. And we love the ‘German Dustman’ look with Endura’s green, waterproof trousers. 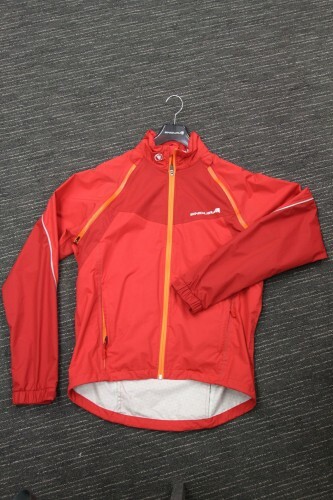 Hey, at least it’s not ‘fisherman yellow’ or fluoro. 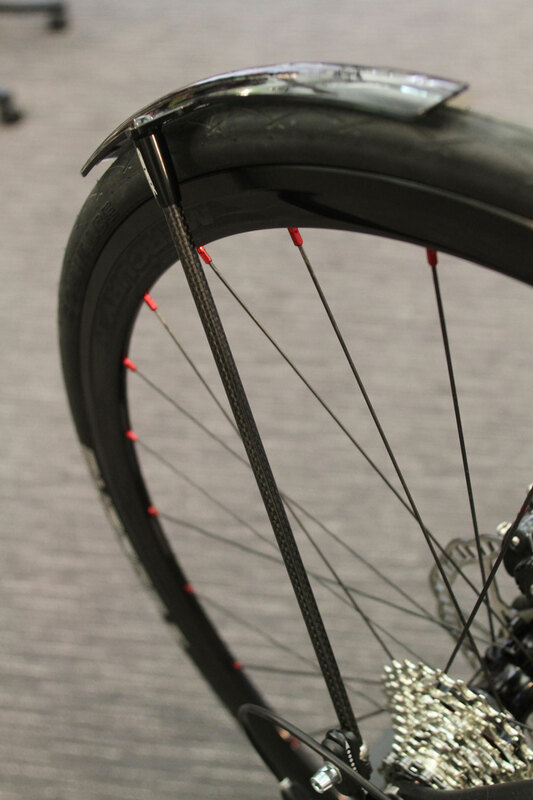 That quirky mudguard retails for £46.50 according to C+. Think I’ll stick with the Crud plastic ones, with near full coverage too. Ok when will we see the Hope 42 toother? I have ummed and arhed about the One up version but I think I might jump if readily available in Hope dealers. I suppose it will have the usual bigH premium though? I to will put the “one up” on hold for now but please lets not have the wait we had for the pedals. Doh! Just ordered a One-Up….